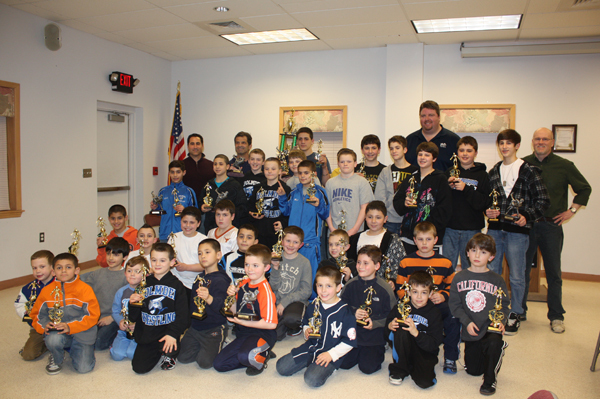 In our second year as a permanent HYAA sport, wrestling made major strides in the Jersey Shore Junior Wrestling B Division. The A and B Divisions have 32 teams in Monmouth/Ocean County and is the most competitive league in the state. Holmdel made the “B” division playoffs and finished 3rd overall, losing a tough match to Keansburg the eventual champ. For the season the boys won 6 matches and lost 10 and were competitive throughout the season. In the end of season individual tournament we finished 6th out of 15 teams in our league. Some highlights from the tournament were Troy Galico and Frank Condito finishing 2nd place, Marco Lamberti, Al Lamberti and Dean Galco finishing 4th place and Zack Bair and Scott Dupont finishing in 6th place. The boys all improved as the season progressed and other first year wrestlers competed on Thursday nights, gaining valuable experience. The team practiced every Tuesday and Thursday from November 16 to February 16th. Wrestlers became more confident and composed on the mats and began winning more frequently. Wrestling moves and techniques were executed more consistently creating favorable situations and increasing our success. Many boys wrestled over 20 matches in the season with some wrestling 6 matches in one day in the end of the season individual tournament. With 40 experienced wresters and only 4 8th graders moving on to the high school level the team is in great position to challenge for the “B” division title in 2012. HYAA will conduct a wrestling clinic in the off season to continue the progress.